Our Goal is to be a customer friendly, full service manufacturer that consistently treats you like our only customer. Whether you need one mold or a large package, we want to be your high quality, fair cost, on time supplier. It is our task and pleasure delivering problem-free products and services on time. Processes and controls shall be implemented such that tasks are performed properly the first time and to ensure that all products and services provided to our customers and to internal operations meet established requirements. Quality, continual improvement and customer satisfaction are our importance. We know that a key to success is to understand the needs of our customers, and we work to develop personal relationships with our customers in order to ensure this understanding. Leadership: At HC-Mold, you receive the kind of quality and service you expect from a leader. Our company is always evolving as the needs of our customers change and as new opportunities are created in the market. You can rest assured that, working with HC-Mold, you will enjoy the latest services, technology and developments in the industry. 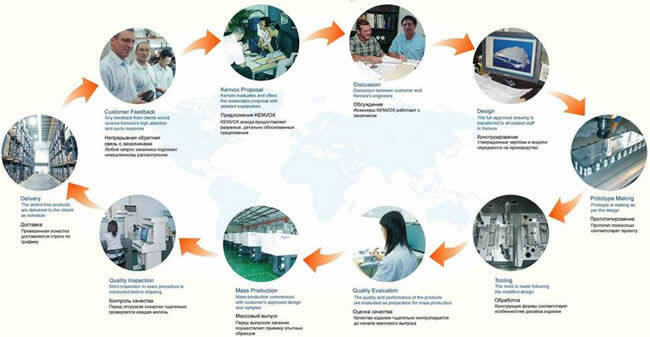 Customer Relations: At HC-Mold, our highest priority is satisfied customers. You are important to us and you can expect us to go the extra mile for your business. Superior customer service is the hallmark of HC-Mold. We are proud to serve you and work hard to earn your business.